Knowing so little of my ancestors and wanting my daughter to be more aware of hers set things in motion. My mother died when I was four years old, and my father was a career Navy man, which meant we rarely saw him. My older sisters and I grew up with our maternal grandmother and her second husband. I never spoke with either of my grandfathers and only met my paternal grandmother once. Living in California, we were quite a distance from the majority of my parent's families: my father's in Colorado, and my mother's, most of whom lived in Hawaii. I started out by collecting information from several relatives in 1997. Next, I subscribed to the usual genealogy subscription services. I then imported several GEDCOMs from fellow researchers. I've acquired dozens of vital records and obituaries. I first published the family tree online in 1999, hoping to connect with others researching the same people. I continue to utilize Internet sources and occasionally the Family History Library Catalog. I've made the tree available elsewhere (Geni) and continue to explore new avenues for feedback. My father's and mother's backgrounds are vastly different. My father's family represented by the surnames: HILL, McINTYRE, KENYON, HURD, HANNAN, POWERS, KANE, and McCORMICK hail from England and Ireland. Most of the family seemed to settle in Rhode Island, New York, Ohio, and Illinois. Some ultimately ending up in Colorado. My mother was the third generation born in Hawaii and was of Portuguese and Chinese descent. Her father, a teenage stowaway to the Pennsylvania coal mines, was born near Lisbon. Her maternal grandfather emigrated from Hong Kong to the Kingdom of Hawaii and married a first generation Portuguese Hawaiian, whose parents were from São Miguel, Azores. 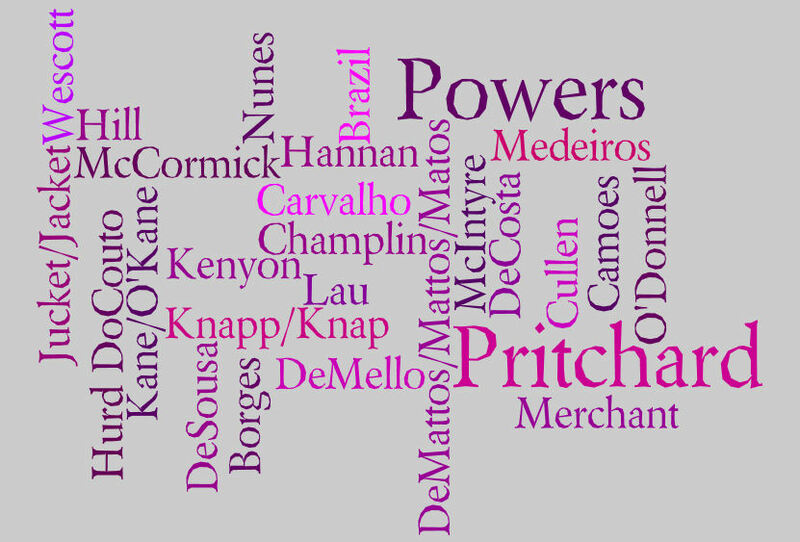 Variations in spelling aside the surnames of my mother's family are DeCOSTA, CAMÕES, LAU, CARVALHO, and DeMATTOS/MATTOS. 1. Virginia Lee HILL: born in San Diego, California. 2. Jack Telford HILL: born 2 Mar 1930 in Denver, Colorado; married 3 Dec 1950 in Las Vegas, Clark, Nevada; died 17 Feb 2002 in El Cajon, San Diego, California. 3. Patricia DECOSTA: born 14 May 1930 in Honolulu, Oahu, Territory of Hawaii; died 30 Nov 1963 in San Diego, California. 4. Ernest Talfred HILL: born 24 May 1900 in Medina Twp., Medina, Ohio; married 19 Apr 1922 in Denver, Colorado; died 21 Aug 1967 in Boulder, Colorado. 5. Margaret Beatrice HANNAN: born 3 Jun 1899 in Chicago, Cook, Illinois; died 10 May 1993 in Boulder, Boulder Co., Colorado. 6. Anthony "Tony" DECOSTA Sr.: born 12 Jul 1903 in Portugal; married 2 Oct 1929 in Honolulu, Territory of Hawaii; died 1 Jul 1976 in Honolulu, Oahu, Hawaii. 7. Rose CHONG: born 8 Sep 1913 in Honolulu, Oahu, Territory of Hawaii; died 3 Nov 1978 in Redding, Shasta, California. 8. John Delbert HILL: born 29 Jun 1861 in Medina Twp., Medina, Ohio; married 7 Nov 1885 in Medina Twp., Medina, Ohio; died 29 Sep 1918 in Denver, Denver Co., Colorado. 9. Charlotte Ellen KENYON: born 30 Apr 1863 in Medina Twp., Medina, Ohio; died 20 Dec 1916 in Denver, Colorado. 10. William James HANNAN: born 3 Jul 1862 in Chicago, Cook, Illinois; married 17 Nov 1892 in Dixon, Lee, Illinois; died 12 Aug 1945 in Boulder, Boulder Co., Colorado. 11. Margaret Beatrice KANE: born 24 Aug 1872 in Tonica, La Salle, Illinois; died 2 Aug 1945 in Denver, Colorado. 12. Ferreira DECOSTA (not confirmed): born in Portugal. 13. Rose CAMÕES (not confirmed): born in Portugal. 14. Lau CHONG: born 3 May 1867 in Hong Kong; married 9 Dec 1912 in Kaneohe, Hawaii, Territory of Hawaii; died 11 Apr 1918 in Honolulu, Oahu, Territory of Hawaii. 15. Maria Augusta CARVALHO: born 21 Nov 1884 in Paauilo, Hawaii, Kingdom of Hawaii; died 19 Jul 1983 in Kailua, Oahu, Hawaii. 16. John Richard HILL: born 25 Dec 1836 in New York; married 28 Jun 1863 in Medina County, Ohio; died 12 May 1911 in Medina Twp., Medina, Ohio. 17. Frances MCINTYRE: born 9 Feb 1840 in New York; died 14 Mar 1916 in Toledo, Lucas, Ohio. 18. Joseph Champlin KENYON: born 17 Mar 1815 in Exeter, Richmond, Rhode Island; married in New York; died 27 Apr 1901 in Medina Twp., Medina, Ohio. 19. Mary Jane HURD: born abt 1832 in New York; died in Medina Twp., Medina, Ohio. 20. John HANNAN: born abt 1835 in Ireland; married Bef 1860; died 9 Oct 1874 in Chicago, Cook, Illinois. 21. Margaret POWERS: born abt 1837 in County of Wexford, Ireland; died 28 Mar 1902 in Chicago, Cook, Illinois. 22. James KANE: born 13 Jun 1835 in Knockancloher, Tralee, County Kerry, Ireland; married 8 Jan 1864 in Naperville, DuPage, Illinois; died 19 Jun 1912 in Chicago, Cook, Illinois. 23. Julia Agnes MCCORMICK: born 4 Oct 1842 in Dennison Mills, Township of Shipton, County of Richmond, Quebec, Canada; died 2 Dec 1916 in Chicago, Cook, Illinois. 28. Lang YEE: born in China. 29. Au NG: born in China. 30. João Germano "John" CARVALHO: born 28 Feb 1857 in San José, Ponta Delgada, São Miguel, Azores, Portugal; married 10 Aug 1885 in Hilo, Hawaii, Kingdom of Hawaii; died 21 Dec 1933 in 54 Rincon Ave., Campbell, Santa Clara, California. 31. Maria das Mercês DE MATTOS: born 27 Jun 1862 in Ponta Garça, São Miguel, Azores, Portugal; died 20 Nov 1948 in Campbell, Santa Clara, California. 32. Richard D. HILL: born 1808 in New York; died 28 Oct 1875 in Medina Twp., Medina, Ohio. 33. Matilda Harriet KNAPP: born abt 1817 in New York; died 4 Apr 1893 in Medina Twp., Medina, Ohio. 34. H. MCINTYRE: born in Vermont. 35. UNKNOWN: born in Vermont. 36. Stuckley Wescott KENYON: born 7 Apr 1791 in Richmond, Washington, Rhode Island; married 1812 in Greece, Monroe County, New York; died 20 Sep 1833 in Greece, Monroe County, New York. 37. Nancy CHAMPLIN: born 1794 in South Kingstown, Washington, Rhode Island; died 1821 in Monroe, New York. 38. John HURD: born abt 1800 in New York. 39. Eliza PRITCHARD: born abt 1810 in New York. 44. Thomas O'KANE: born in Ireland. 45. Lucy O'DONNELL born in Ireland. 46. James MCCORMICK: born abt 1820 in Ireland; died after 1880. 47. Margaret CULLEN: born abt 1820 in Ireland; died bet 1860 and 1865 in Illinois. 62. João "John" DE MATTOS: born 13 Mar 1833 in Ponta Garça, São Miguel, Azores, Portugal; married 16 Sep 1861 in Ponta Garça, São Miguel, Azores, Portugal; died 19 Mar 1917 in Waipunalei, Hawaii, Territory of Hawaii. 63. Claudina Rosa De Jesus BRAZIL: born 2 Jan 1843 in Furnas, São Miguel, Azores, Portugal; died 21 Jul 1932 in Olaa, Hawaii, Territory of Hawaii. Copyright Fundamentals for Genealogy - An article dealing with copyright specifically for genealogists. Encyclopedia of Genealogy - An online user-contributed genealogy reference manual. National Association of Counties - Excellent for identifying cities and counties in the U.S.
Social Security Numbers by state - Locate the state where a Social Security number was issued. Time and Date (Perpetual Calendar) - Need a calendar for any year, this is where you find it. Birth Date Calculator - Easily calculate a birth date based on age at death. RootsMagic Genealogy Software - A powerful and easy to use program filled with clever tools. Ancestry.com - The premier site for genealogy databases. Cyndi's List - A categorized & cross-referenced index to genealogical resources on the Internet. Family Search Internet Site - Indexes and millions of images available for download. Find A Grave - Find the graves of ancestors, create memorials, upload photos, etc. Fold3 - Search or browse for military records, historical documents, newspapers, person pages, and more. The United States Newspaper Project - Search for microfilmed newspapers available for Interlibrary loan or purchase. Castle Garden - Search immigration records (NYC) 1820 - 1913. Ellis Island - Search immigration records (NYC) 1892 - 1924. Rootsweb California Site - Starting place for finding Rootsweb's California resources. California Death Index, 1905-1939 - Index and images of death indexes at Family Search. California Death Index, 1940-1997 - Name index created by the Vital Statistics Section of the California Department of Health Services. Boulder County Clerk and Recorder Database - Search for county tax records, deeds, marriages, etc. Denver County CoGenWeb Site - A GenWeb site dedicated to Denver County, Colorado. Colorado State Archives - Legal and Historical Records, Online indexes, etc. Denver Public Library's Obituary Index - Denver Post and Rocky Mountain News 1936 through 2005 (incomplete). Hawaiian Genealogy Indexes - Marriage, Court, and Citizenship Records. Hawaii State Department of Health - How to order Vital Records for Genealogical Purposes. Illinois State Genealogical Society - Projects and links specific to Illinois. Illinois State Archives Death Certificate Database - Illinois Statewide Death Index for deaths before 1916. Illinois State Archives Death Certificate Database - Illinois Statewide Death Certificate Index from 1916 through 1950. Illinois State Archives Marriage Database - Illinois Statewide Marriage Index from 1763 through 1900. Newberry Library - The library's genealogical services and resources. Cook County Recorder - How to obtain genealogy records through the Cook County Recorder's Office. Cook County Clerk's Office - Search for vital records dating back to 1872. Medina County Obituary Index - Medina County District Library's Searchable Index. Cleveland Necrology Files - Death Notices and cemetery records from 1833-1975 from Cleveland Newspapers Sources. OHS Death Database - Ohio Historical Society's Death Certificate Database 1913 through 1944. Toledo Library - Toledo Blade Obituary Index 1837 to present. Ohio Department of Health - How to request vital records. Columbus Metropolitan Library - Columbus Newspaper Index of Obituaries from 1931 through 1997. Akron-Summit County Public Library - Index to Obituaries Published in the Akron Beacon Journal. Arizona Birth and Death Certificate Database - View certificates online. Massachusetts Archives - Archives and vital records database. Seeking Michigan - Search for historical documents, photographs, and maps. Minnesota Historical Society - Family history databases and resources. Azores GenWeb Site - An excellent resource for researching our Azorean Ancestors. LusaWeb Genealogy Forum - Portuguese Genealogy Resources. Portuguese to English Dictionary - Also translates English to Portuguese. Ask About Ireland - Griffith's Valuation - Search the database by Family Name or Location. Irish Genealogy - More than 3,000,000 church records available for several counties and Dublin.